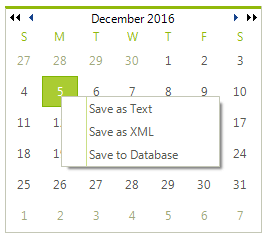 To implement context menus use RadContextMenu in your application. RadContextMenu is a non-visual component that sits in the component tray located below the form design surface. RadContextMenu, like RadMenu, can be themed and has an items collection that accepts RadMenuItem, RadMenuComboBoxItem, RadMenuSeparatorItem and RadMenuContextItem. For those RadControls that have a ContextMenu or RadContextMenu properties you can assign the RadContextMenu in the designer or in code. The ContextMenuStrip property refers to a Windows standard control. This property drop down will not display RadMenu or RadContextMenu components that exist on the form. Handle the mouse down event for the control that requires the context menu and call the RadContextMenu.Show() method.